Fujifilm has announced its new X100F premium rangefinder featuring a unique Advanced Hybrid Viewfinder that can switch between an optical viewfinder and electronic viewfinder. The new X100F is the fourth generation release from the series that introduced the first hybrid viewfinder. Featuring the latest 24.3-Mp X-Trans CMOS III APS-C image sensor, high-speed image processing engine and a Fujinon 23mm f2 lens, the X100F delivers outstanding color reproduction and gradation of tones in both stills and videos, the company said. 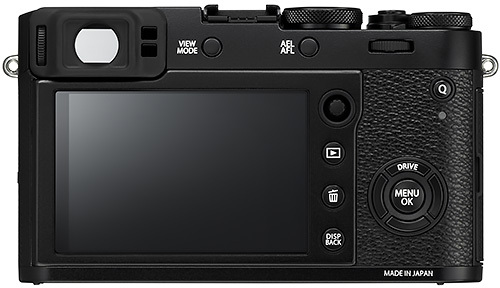 The new X100F has enhanced AF performance with improvements to basic response time specifications including a startup time of approximately 0.5 seconds, a shooting interval of 0.2 seconds, shutter release time lag of 0.01 seconds and AF speeds as fast as 0.08 seconds. 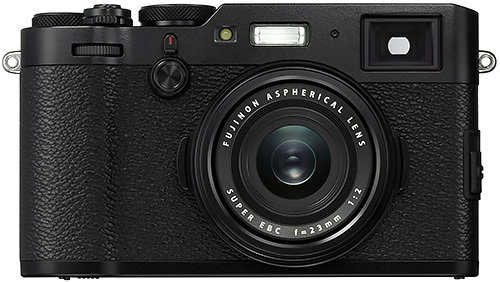 The new X100F in black or silver will be available in February for $1,299.95. Adorama is accepting pre-orders for the black or silver version and B&H is also accepting pre-orders for the black or silver version. VALHALLA, N.Y. -- Fujifilm North America Corp. has announced the Fujifilm X100F, the new premium rangefinder style compact digital camera featuring a unique Advanced Hybrid Viewfinder that allows users to switch between an optical viewfinder and electronic viewfinder. The new X100F is the fourth generation release from the series that introduced the first hybrid viewfinder camera for ultimate flexibility, style and premium image quality. Featuring the latest 24.3-Mp X-Trans CMOS III APS-C image sensor, high-speed image processing engine and a high-performance Fujinon 23mm f2 lens, the X100F delivers outstanding color reproduction and gradation of tones in both stills and videos, while providing photographers with increased mobility and an unsurpassed user experience. The Fujifilm X100F uses an Advanced Hybrid Viewfinder that combines the features of an Optical Viewfinder with an Electronic Viewfinder for enhanced performance and convenience. While in Electronic Rangefinder mode, users can now change the magnification, shown as EVF in the optical viewfinder, for greater accuracy when checking focus. The small EVF window can display 100 percent field of view as well as 2.5x and 6x magnifications and the EVF frame rate has been increased to 60 frames per second. To provide users with perfect framing and focus while using the Manual Focus mode, the Real Time Parallax Correction function is applied to the focus area in addition to the guide frame. Photographers can also now check exposure and white balance in the EVF window, making it the ultimate viewfinder while providing all the benefits of the EVF while shooting through the OVF. The new X100F has enhanced AF performance with improvements to basic response time specifications to ensure the camera operates exactly as the photographer intends. Making it perfect for quick snapshots, the X100F has a startup time of approximately 0.5 seconds, a shooting interval of 0.2 seconds, shutter release time lag of 0.01 seconds and AF speeds as fast as 0.08 seconds. The X100F gives users six AF modes including Single Point mode, Zone mode and Wide/Tracking mode for both AF-S for stationary subjects and AF-C for moving subjects. The number of focus points in the X100F has been dramatically increased to 91 (up to 325 points), up from 49 in previous models, with approximately 40 percent of the imaging area covered with phase detection to form a fast and precise AF area that can be used in a variety of scenes. By combining these features with a greater ability to autofocus on points of light and low contrast objects, the X100F captures beautiful detail in pictures with fine and delicate textures, helping to reproduce images just as photographers remember. The Film Simulation function now features ACROS mode for even more artistic photos. Using X-Processor Pro's advanced processing capability, the mode offers smooth gradation, deep blacks and beautiful textures to create stunning monochrome images. The X100F also features the Grain Effect function for reproducing distinctive graininess seen in photographs taken with film cameras. The function is available in a Strong and Weak setting and can be combined with any of the Film Simulation modes. Photographers can now easily achieve the creative effect of film-based photos, notable especially when the image is printed out. To provide photographers with an extraordinary experience, the rear face of the Fujifilm X100F has been redesigned to concentrate most of the frequently used functions on the right-hand side. This allows users to change camera settings quickly while holding the camera firmly and without having to take an eye off the viewfinder. The Focus Lever positioned on the rear side of the camera allows users to use joystick-type operations in eight directions to easily select a focus area. The X100F also now features a built-in ISO Dial that is incorporated into the Shutter Speed Dial for further ease of use. This enables the user to easily check ISO and Shutter Speed, in addition to aperture and exposure compensation, from a glance without having to power on the camera. There is also a Focus Lever on the rear of the camera body to instantly move the focus area and a completely silent electronic shutter capable of exposures up to 1/32000 seconds. The external surface of the X100F is finished with synthetic leather that provides high durability and excellent resistance to the elements while providing photographers with the benefit of slip resistance and a comfortable hold. Leather Case LC-X100F: user can change the battery and media card while the case is attached to the camera. Wide Conversion Lens WCL-X100 II: dedicated wide conversion lens that multiplies the fixed focal length by approximately 0.8x, converting it to 23mm (35mm format equivalent) for capturing broader views when shooting in tight spots or landscapes. Tele-Conversion Lens TCL-X100 II: dedicated tele-conversion lens for narrowing the field of view by multiplying the fixed focal length by approximately 1.4x, converting it to 50mm (35mm format equivalent) for shooting portraits or close-up photography from as close as approximately 5.5in/14cm. The new Fujifilm X100F Digital Camera (Black and Silver) will be available in February in the U.S. and Canada for USD $1,299.95 and CAD $1,699.99.